A primer for organizations considering development of a certification program. Provides detailed guidance on how to decide if your organization should create such a program. What are the credentialing options? Which is right for your organization? How do you conduct a feasibility analysis? How do you write a business plan? How do you set up the governance structure? What staffing do you need? These are just a sampling of the questions you'll get answers to! Contains must-have information and advice not found anywhere else in print. Click here for more information, to preview the table of contents, or to purchase directly through the publisher. "Mickie has made a complex decision-making process simple. We followed the systematic, knowledge-based process outlined in this guide and we saved immeasurable amounts of time, talent, treasure, and credibility while ultimately meeting the desired outcomes for the profession with a service that our members wanted." If you’re new to the certification role, you’re likely realizing this is a responsibility unlike any other you’ve had. Certification is a complex topic. There’s a lot to learn and the stakes are high. Readers will learn the certification essentials, like: What’s the difference between certification, certificate programs, licensure and accreditation? What are the steps to developing a quality certification program? (what’s a job analysis? what are test specs?) What are the key legal issues and how do we avoid them? What are the key certification concepts and testing terms I need to know? What are the industry standards for certification programs? Where can I go for more training or information?. A small paperback you can give to every staff and board member. Click here to purchase directly through the publisher, the American Society of Association Executives. A key to unlocking the standard, ISO/IEC 17024 Conformity assessment – General requirements for bodies operating certification of persons (2012), is understanding its terminology and core concepts. This publication is a simple reference guide defining the terms and explaining the core concepts in the standard. 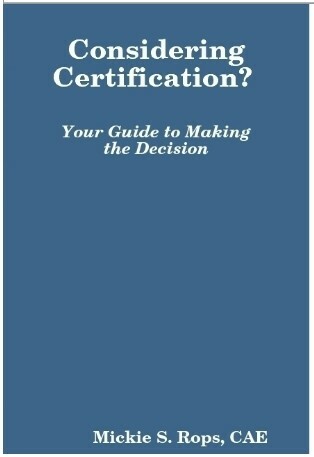 I wrote this guide based on my 20 years of experience as a certification staff executive, leader and consultant and my experience as assessor for the American National Standards Institute’s Personnel Certification Accreditation Program (which is based on the 17024 standard). Since the first edition of the standard was published in 2003, I’ve guided dozens of organizations in meeting the 17024 standard and, when desired, achieve ANSI accreditation. This guide won’t tell you how to implement the standard’s requirements (because that will be different for every organization), but it will help you make sense of the often intimidating world of certification in general and this international standard specifically. This guide is currently only available to Mickie Rops Consulting LLC clients and workshop participants. Click the Learning, Retreat or Services links to the right to learn more.